Butterfingers is an inhabitant of the Amazon Jungle and the assistant of the famous and powerful witch doctor Dr. Sheldon. In The Super Mario Bros. Super Show! episode "Jungle Fever", Butterfingers, while aiding Dr. Sheldon in helping some of his Mushroom Person patients, witnesses him get kidnapping by King Koopa and his Shyguy minions. 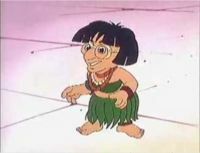 After Dr. Sheldon's kidnapping by King Koopa, Butterfingers is employed by Princess Toadstool to help her create a No-Itch Potion, which can be used on Mario, Luigi and Toad, who are suffering from extreme itchiness due to being doused in King Koopa's Koopa Strength Itching Powder. At first happy to help Princess Toadstool, Butterfingers eventually loses faith in herself when she accidentally creates a duplication potion instead of a No-Itch Potion. With Butterfingers unable to help Mario, Luigi and Toad, Princess Toadstool decides to go save Dr. Sheldon herself from King Koopa, much to Butterfingers protestation. Later, after Princess Toadstool travels some distance through the Amazon Jungle, she meets Butterfingers, who had decided to help Princess Toadstool in rescuing Dr. Sheldon from King Koopa. After being thanked by Princess Toadstool for deciding to help her, Butterfingers points-out a large amount of smoke emanating from a nearby stone structure, which she surmises was being created by Dr. Sheldon. Climbing the stone structure, Princess Toadstool and Butterfingers see Dr. Sheldon in the midst of creating a potion for King Koopa, willingly and without protestation. Shocked at what Dr. Sheldon is doing, Butterfinger, along with Princess Toadstool, are scared from their hiding place behind a pillar by a Cobrat, allowing King Koopa to see them. As King Koopa has his Shyguy minions restrain Princess Toadstool, Butterfingers begins to berate Dr. Sheldon, who is preparing to douse Princess Toadstool in a potion that will turn her to stone, saying that she officially resigns as his assistant. Ignoring Butterfingers, Dr. Sheldon, grabbing a bucket full of potion, throws it at Princess Toadstool, though not before telling her to duck. Doing as Dr. Sheldon commanded, Princess Toadstool manages to bend over before Dr. Sheldon's potion hits her, allowing it to hit King Koopa instead. After King Koopa is doused in Dr. Sheldon's potion, Butterfingers, Princess Toadstool and King Koopa's Shyguy henchmen can only watch in shock as King Koopa falls to the ground and begins to scratch himself crazily, proclaiming he's incredibly itchy; as King Koopa spasms on the ground, both Butterfingers and Princess Toadstool summarize that Dr. Sheldon had never joined King Koopa, he had been planning to dunk his Industrial Strength Itching Potion on him. With King Koopa defeated, Dr. Sheldon, Butterfingers and Princess Toadstool return to the village in the Amazon Jungle; Butterfingers is last seen watching as Dr. Sheldon gives his, in actuality, fake antidote to Mario, Luigi and Toad to cure their itchiness, spaghetti. This page was last edited on March 20, 2019, at 19:50.